Chronic wasting disease (CWD), a fatal neurological disease of cervids, was first identified in free ranging deer in Michigan in 2015. Research from other states that have been dealing with this disease for decades has shown long-term, irreversible impacts to localized deer herds. The Michigan Department of Natural Resources has identified this disease as a management priority, and has undertaken extensive efforts over the past three years to the management and surveillance of the disease. These efforts thus far have dramatically improved the knowledge of where CWD exists in Michigan, and knowledge of where it exists is an important first step in helping combat the disease. With over 100 positive animals identified in the state since 2015, the Department will likely face management challenges for the next few decades. Funding, social support, surveillance capacity, and management actions will all play a part in the success or failure of CWD management in the future. 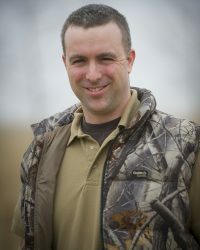 Chad Stewart has been the deer, elk, and moose management specialist for the Michigan DNR, since 2014. Previously, he worked as the deer biologist for the Indiana DNR and a research biologist for the Smithsonian's Conservation Biology Institute. He has a B.S. in Wildlife and Fisheries Sciences from Penn State University, and a M.S. in Natural Resources and Environmental Sciences from the University of Illinois.